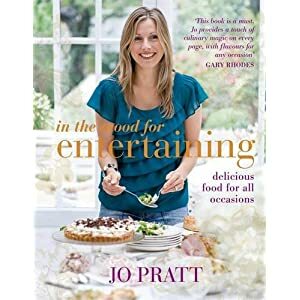 Jo Pratt's latest book 'In the Mood for Entertaining' is a must for every sociable household! Packed with quick and easy but utterly delicious recipes for every occasion, I have 3 copies of this gorgeous cookery book to giveaway. You can check out Jo's indulgent home-made ice cream recipes above. Jo shows how making ice cream is easy as pie with Gaggia's Gelatiera ice cream machine. To be in with a chance of winning one of these lovely books all you have to do is leave a comment including a way of contacting you if you win. Remember to leave a seperate comment for each entry. This is a UK only giveaway, closing date is 29th October 2011 at 12 noon. 17 comments on "Jo Pratt - In the Mood for Entertaining Book GIVEAWAY"
Love to entertain amd will always welcome new ideas! I follow this blog via GFC (Snow_Bunny). I follow The Breastest News Blog on Facebook (Carolina J. ).